SQUAMISH, BC – Howe Sound Brewing has announced the launch of Ales For Change, a series of limited edition beers that will assist fundraising activities in different communities. 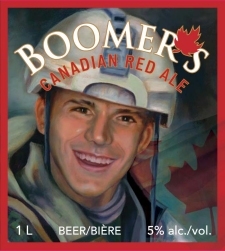 The first beer in the series, Boomer’s Canadian Red Ale, was named in honour of Andrew “Boomer” Eykelenboom, a Canadian Armed Forces Medic killed in Afghanistan in 2006. In his memory, his parents set up the Boomer Legacy Fund, with all proceeds being given to a CAF trust fund for solders in Afghanistan to distribute to needy causes within the war-torn country. Boomer was known to have an appreciation for good red ales, and this Canadian Red Ale is brewed with five different malts with Magnum and Perle hops. We know he would have enjoyed it. We hope you will too. Boomer’s Canadian Red Ale is available now in 1 litre bottles at BCLD locations throughout British Columbia, and it will remain on the market for approximately three months. A dollar from every bottle sold will be donated to the Boomer Legacy Fund. Doesn’t Central City Brewery have a Boomers Red ? We did have a Boomers Red in the past, and may again one day. Not to worry though, we have a strong relationship with our friends at Howe Sound and there will be no harsh words between us regarding this beer. If we ever do bring back Boomers Red we may opt to donate to the same charity even. I just saw this beer yesterday at our Upper Ganges Liquor Store on Salt Spring Island and I bought a bottle for my husband (sort of pre-Valentine’s Day). He said it is an excellent ale, one of the best he has tasted in a long time. And I bought him a very large selection of beers and ales from all over the world for a Christmas present last December, so he has tasted many varieties. I think this is a wonderful idea of Howe Sound Brewing Company to donate $1/bottle to such a worthy cause in memory of a brave young Canadian who had so much to give to this world.